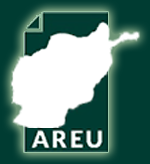 The Afghanistan Research and Evaluation Unit (AREU) is pleased to share the findings of a study on Gender-Based Violence (GBV) among Internally Displaced Persons (IDPs) children in Kabul that provides a broader picture of the situation on-the-ground. IDPs in this study are identified as those people who are displaced because of conflict in other parts of Afghanistan and have been settled in Kabul for less than a year. They are willing to go back to their place of origin as soon as security allows. 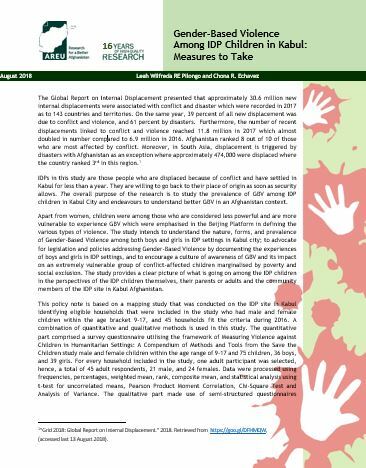 The overall purpose of the research is to study the prevalence of GBV among internally displaced children in Kabul and endeavours to understand better GBV in the context of Afghanistan. Apart from women, children were among those who are considered less powerful and more vulnerable to GBV, as emphasised in the Beijing Platform in defining various types of violence. The study intends to understand the nature, forms, and prevalence of GBV among both boys and girls in IDP settings in Kabul; advocate for legislation and policies addressing GBV by documenting the experiences of boys and girls in IDP settings; and encourage a culture of awareness of GBV and its impact on an extremely vulnerable group of conflict-affected children marginalised by poverty and social exclusion. The study provides a clear picture of what is going on among these children based on their own perspectives, as well as their parents and other adults throughout the IDP community sites in Kabul.